What do you get when someone leaves a silly blue figurine on their desk? 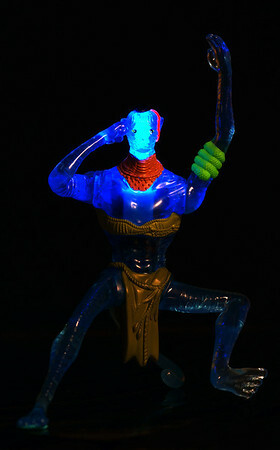 A snap of a silly blue figurine who's head lights up+when you touch him. Thanks for all the comments yesterday on the dog's necklace. The number has no significance, probably just her SPCA number. She never grew very big and we had her for around 15 years. She was a special little dog and has been gone for 15 year, but+never really forgotten. Boy, I really will have to inspect those McD toys more closely. Come to think of it, we may have some lightup one in the house! Cool shot! Mc Donalds toys have never looked better. I am happy he is back safe and unharmed on my desk. Great work!! Beautiful lighting and colour effects!